Within two days, we turned the space in front of the Mohamed V lyceum in Marrakech from a space dominated by parked cars into a space for people passing-by, waiting, sitting and interacting. While the scale, size and urban morphology of the Medina in Marrakech are perfect to walk and cycle everywhere, most of the space in streets and squares is utilized to park cars. In the space left, motorcycles race zigzagging, leaving a cloud of smog behind them. Pedestrians and cyclists need to accommodate to the space left for them by the other transport means. How to reverse this hierarchy and give space back to the people? 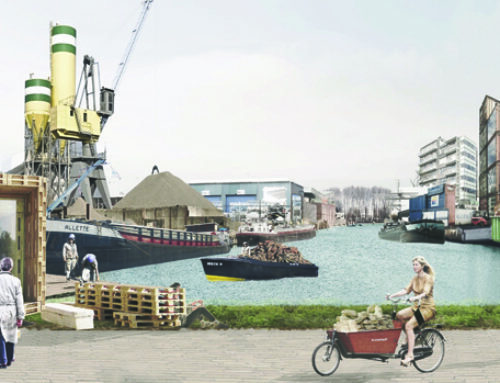 How to utilize and enhance the potential that the Medina has for active mobility by foot or by bike? At Riad Larousse, in front of the Mohamed V lyceum, we started this paradigm change with a temporary intervention that reclaimed more space for people during a week. 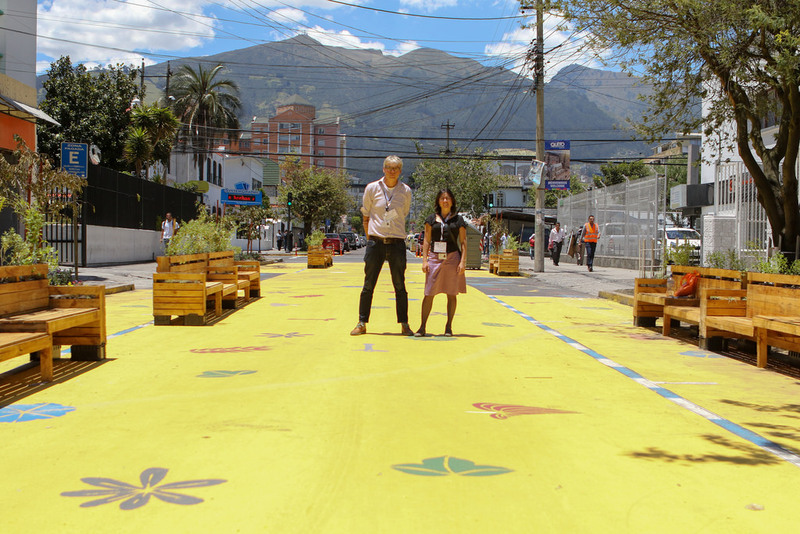 The location: Children, youth, tourists and informal economy using flexibly the space. The street space is particularly flexible and active in the medina of Marrakech. It is a working area for many, like people repairing motorcycles or small electrical appliances, or is the marketplace to offer their services by exposing their working tools or transport means available for rent. At the same time, it is the meeting place for many various groups along the day and evening, from tourists to old men groups and mothers with children among others. The area selected for the intervention, in front of the Mohamed V Lyceum at Riad Larousse is particularly rich in the different groups that use it and the forms of appropriation of the street space at different times of the day and night. 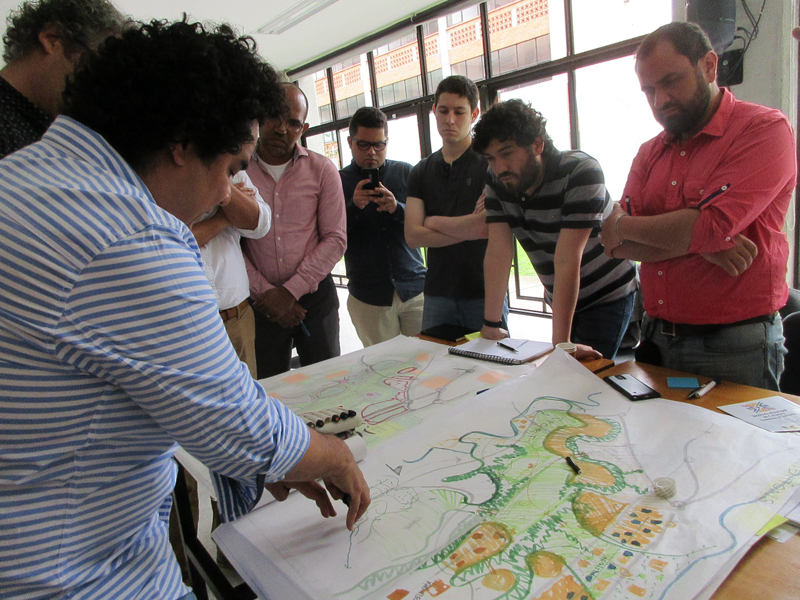 The intervention can therefore exemplify the possibilities for change other similar areas in the Medina. The entrance of the school is a very important function as the meeting place for children and youth going to school, it is also where the school breaks are hold, and the meeting place for parents and family waiting at the end of the day. At the same time, the same space is a common pick up place for tourists, a bus stop and a waiting area for taxis. In the evening, when the school closes, groups of old men sit against the way to chat and observe the passers-by. Besides static people, the area has flows from different directions. It is the connection between two pedestrian streets from the medina so there are many passers by walking, cycling and in motorcycles. It is also an important car and bus connection through the Medina. At the same time, across the street from the school, there is the working space for many small businesses, transport rent and there is a carpenter atelier. The goal, to reclaim more space for the people. When looking at the current organization of the space at the intervention area, it is clear that most of the space is dedicated to cars and buses. While there is a very large flow of pedestrians along the whole day, these need to accommodate to the space left for them between the cars, busses and motorcycles parked and riding across. In front of the school there are metal fences that avoid cars to park against the wall as they used to do it before. According to the director of the school, he asked many times the municipality to place those metal fences because there was not space for the children to leave the school. One day, a bus parked next to the entrance door of the school and nobody could enter or leave the school until 12 o clock when the driver of the bus arrived. Besides these metal fences, cars, vans and busses are continuously parked blocking the pedestrian flow and limiting the space for the groups of students leaving the school at the same time. Therefore, we decided to reclaim more space in front of the school to give space for pedestrians passing by, to the students of the school entering or leaving the building and to all the different groups of locals and tourists that cross and wait in the area during the day. 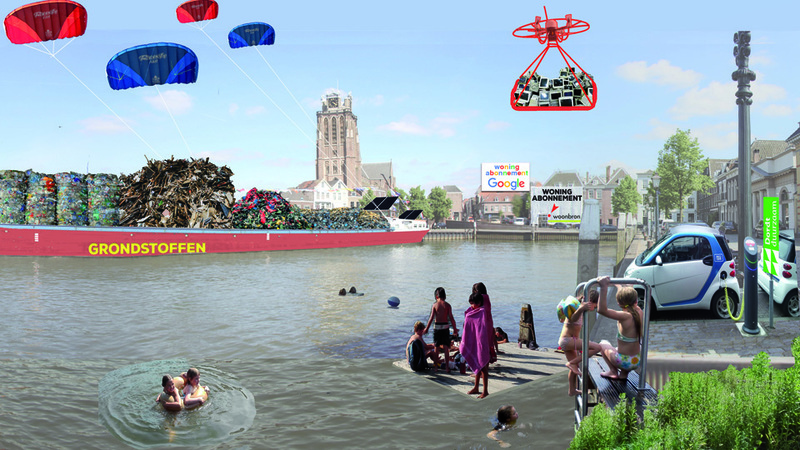 The intervention, reusing common objects. The intervention was realized with materials which are recurrent in the daily image of the urban space in Marrakech. The materials we used were picked up from what people already uses in the streets as a way to define and reserve their working area in the public space. They were all obtained at the scrap market of Marrakech. 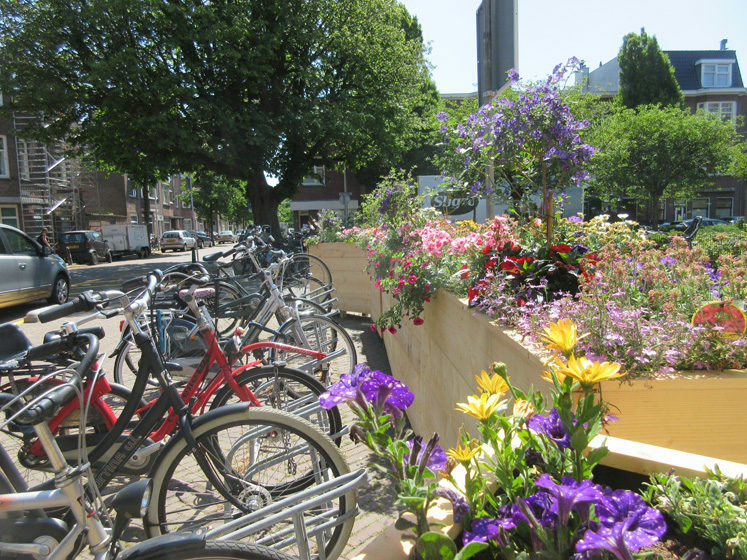 To limit the reclaimed pedestrian space and avoid cars to park there, we used old paint barrels with plants. In many streets, squares and sidewalks in Marrakech, people are already using old painting and oil barrels with plants to mark certain space they are using in their daily work. 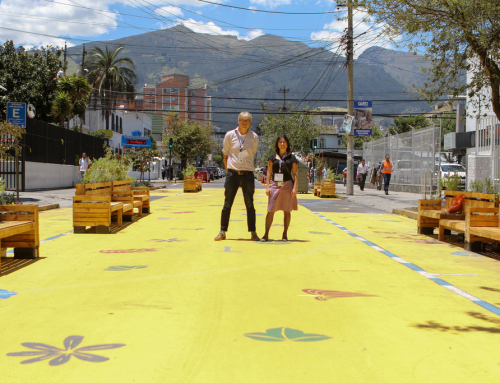 The floor was painted to give the road pavement a different meaning, to emulate a carpet. A carpet has the connotation of a living room, of a place to stay. Using the painted carpet, we wanted to change the imaginary from a road for cars to a place to stay, socialize and have some rest. The pattern of the painting was reminding common geometrical figures in the Marrakech buildings. Sitting elements were created by reusing plastic water crates and wood extracted from leftover pieces of doors. The idea was that people could move them according to their needs at different times of the day. Realizing the intervention and the generated local commitment. On a Monday morning, we stood in front of the school with the elements we had prepared beforehand: barrels, plants, soil, water sitting elements, paint and stencils waiting for the parked cars to leave and occupy the space with the orange painted barrels and sacks full of soil. The whole process of painting, waiting for the paint to dry and planting the plants in the barrels attracted a lot of attention from the school, the passers-by (walking and by bike) and all the people working in the streets around (taxi drivers, mechanics, cigarette vendor, shop workers). The interaction between the team working in the intervention and people around increased during the day. Children of the school helped us painting some of the ground carpet. In the afternoon, when we started planting, they also helped us and some of the taxi drivers and locals joined us. Many people wanted to help with the plants and suddenly they were bringing water and watering the plants by their own initiative. At the end of the day, a square was created in front of the school and immediately there were people sited in the benches. This repeated in the evening and the days after with different groups of users that were sitting in the benches to have a chat, wait or just looking at the activity of the street. Also, passers-by had a space of their own and didn’t have to find their way in their route between two parts of the Medina between parked cars. The natural walking route was restored and widely used. How to continue:After the intervention was completed, people were very enthusiastic about the big impact it had in their daily use of the space; some asked us to do the same in their own neighbourhood, and somebody else said we could do the same in front of a hospital in the Medina. These reactions, and in general the reception of all the users and neighbours of the area of Riad Larousse towards the intervention shows the good response and positive attitude towards a definitive square in that place. 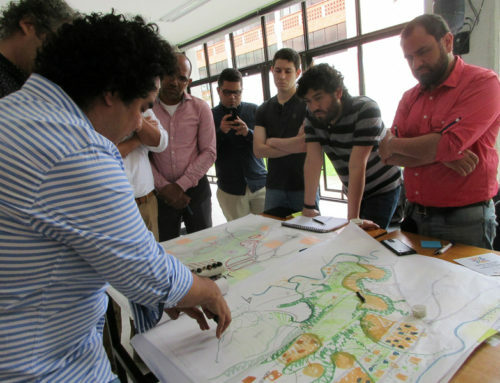 It is therefore important that the different actors get together to start redesigning the area based on the lessons from the temporary intervention. 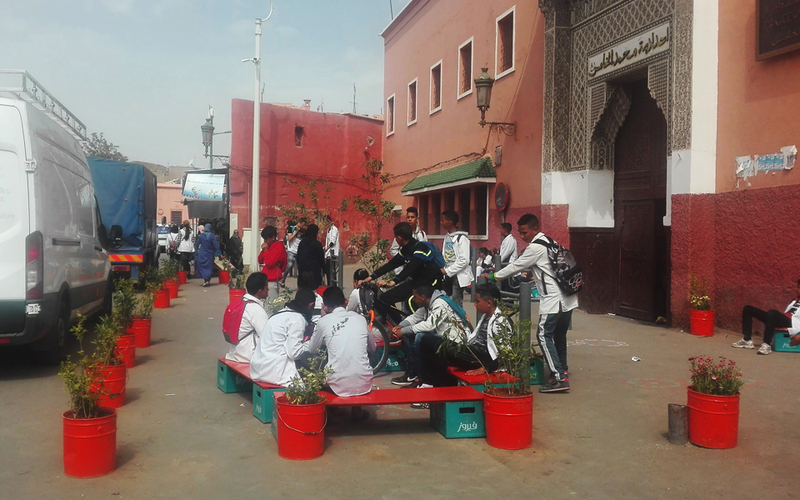 The creation of a definitive square in front of the school can be the first step in a process to redesign the public space in Riad Larousse. The following step can be to connect the new square in front of the Mohamed V lyceum with the garden. Finally, we hope this way to work through experiments in the public space can be utilised in other areas of the Medina to inspire the local community about the possibilities to make the Medina more pedestrian and bike friendly and greener. Team: Camila Pinzon (Urbanos), Angela Mimica and Christian Juica (Otro camino), Zahra Ait Boumessaoud, Youssef Sarhraoui, Iss Àm, (Pikala bikes). Many thanks to Cantal Bakker and the wonderful Pikala team, to the neighbours at Riad Larousse, the children and youth of the Lyceum Mohamed V, the taxi drivers, the cigar vendor, and the old men that sit every evening against the wall. Their enthusiasm and positive reaction to the intervention supported our work during this short but intense experience of reclaiming more space for the people in Marrakech. More information: The Dutch national television (NOS) made an item about the seminar and the opening of Pikala bike’s new location as a close up of the seminar. The Dutch Cycling embassy wrote about the seminar and our tactical urbanism intervention in Marrakech.